Bring a pan of water to the boil, add the broccoli and cook for 1 min, then add the peas. Cook for 1 more min, then drain and rinse under cold water. Blitz the broccoli, peas, courgette, spinach and basil in a food processor with the Parmesan, olive oil, garlic, lemon and lime zest and juice, and the pine nuts until smooth. Add a splash of cold water if the consistency is too thick. Bring a pan of water to the boil and cook the pasta according to pack instructions. Meanwhile, drizzle the tomatoes with oil and pop them under a hot grill for 5 mins or until just about to burst. 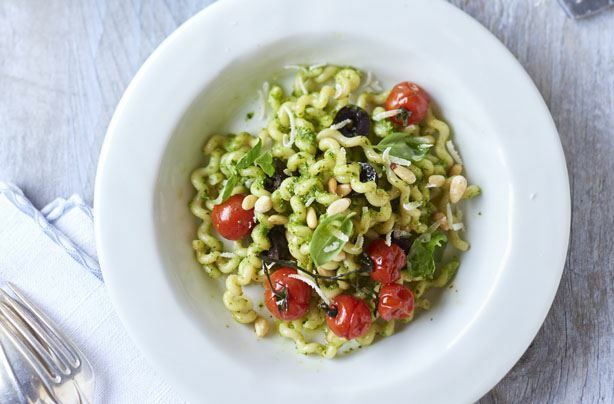 Take your pan off the heat, stir the cherry tomatoes, olives and about half of the pesto into the drained pasta. Don’t heat the pesto, it tastes lovely and fresh as it is.